Fancy a fireplace above the clouds? How about a cinema, or stalls for the racehorses you are taking along? No problem! 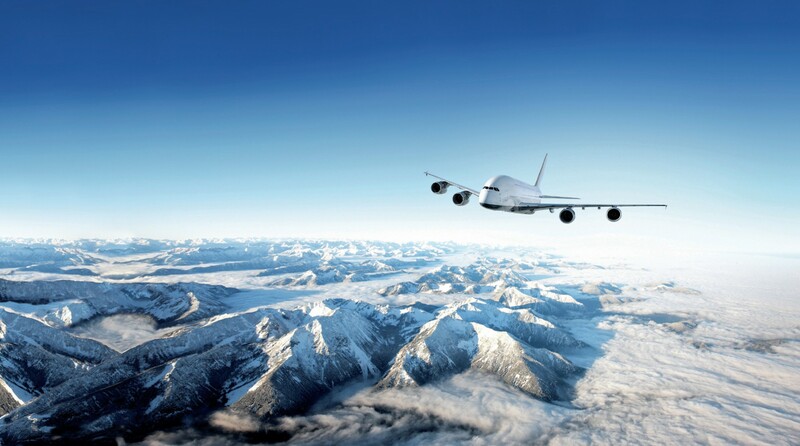 Lufthansa Technik is regarded as the specialist for turning large passenger planes into customized luxury aircraft. But all super discreet. 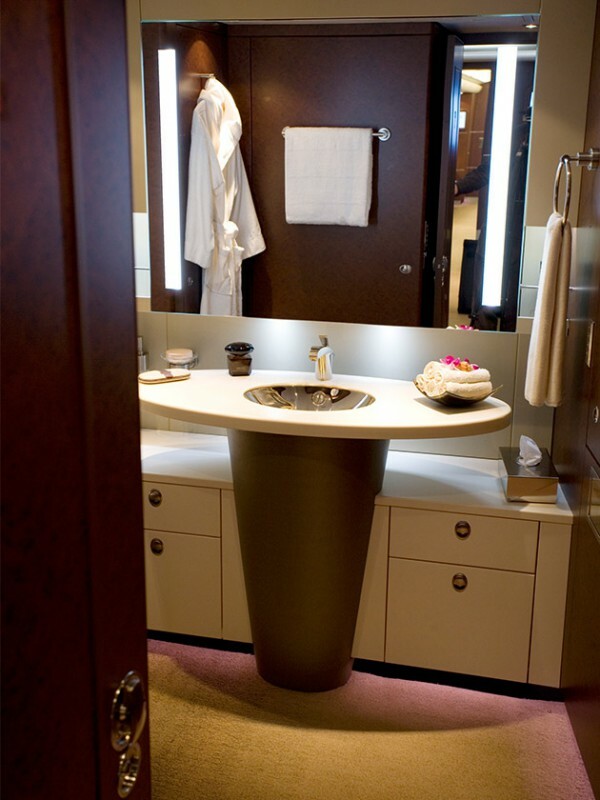 The interior details of these private jets are among the best kept secrets in the industry. Hidden behind a futuristic-looking gatehouse is a high-tech workshop. The low-rise glass building in which it is housed has a curved metal roof that glistens like silver in the sun. The open space in front of it has been landscaped with sky-blue shards of glass instead of lawns. The architecturally striking factory gate, which is reminiscent of a plane’s horizontal stabilizer, has been nicknamed “the stingray” by the employees. Security checks are mandatory here at ­Lufthansa Technik in Hamburg – no one is allowed to enter the grounds without a security pass or appointment. The hangars and office buildings lie parallel to Hamburg Airport’s main runway and form part of its high-security area, with direct access to the apron. In the tall hangars, there is much that is classified. “No photographs, please,” we are told during our visit. Not only is the routine servicing of passenger aircraft conducted here, it is also where the special orders are assembled. 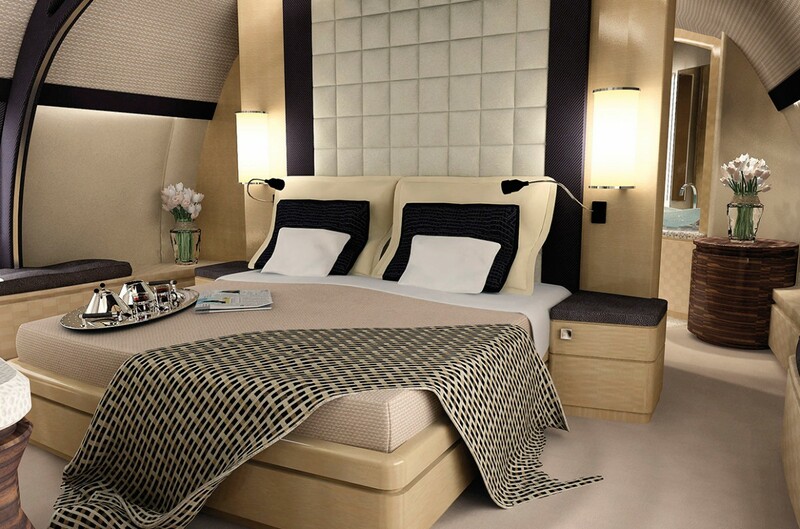 Heads of state and rich Arab clients form the majority of those who commission Lufthansa Technik with transforming commercial aircraft into private luxury jets. 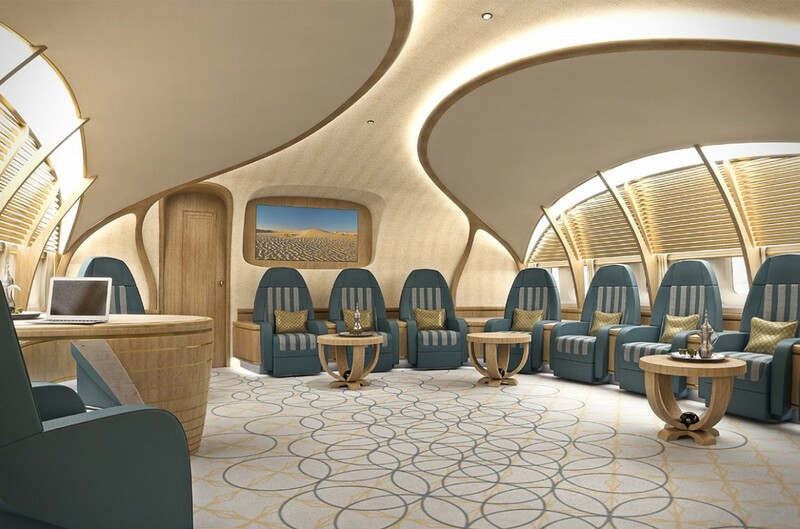 The interior design of these private aircraft is, naturally, top-secret. Converting large commercial airliners into flying palaces is only one of Lufthansa Technik AG’s many business activities. An independent company since 1994, this wholly-owned Lufthansa subsidiary “has become the leader in the global MRO industry,” says Johannes Bussmann, the company’s 46-year-old Chairman of the Executive Board, who has held the post since April 2015 and holds a PhD in aerospace engineering. The abbreviation he alludes to stands for maintenance, repair and overhaul. Lufthansa is not the engineering company’s only client. There are roughly 800 other airlines and aviation companies on the client roster of the global market leader. Lufthansa Technik has long since created its own worldwide network of 53 companies with locations in Ireland, Malta, the Philippines, the U.S. and in Shenzhen, China. However, the 750,000-square meter hangar in Hamburg with its 10,600 employees remains the heart of the group. When the first scheduled commercial Lufthansa flight took off in April, 1995 (the German airline had been newly founded after the war), Hamburg was already an aeronautic engineering base, something Helmut Schmidt – then a member of the German parliament and one day to become German chancellor – had campaigned for. Propeller-driven planes like the Convair 340 and the four-engined Lockheed Super Constellation were the first to be serviced at the Hamburg base, in the city’s Fuhlsbüttel district. In the early 1960s, a test station for jet engines and a noise-protection hangar were added – the first in the world. Since then, the high-tech company, whose 2014 turnover was 4.3 billion euros, has been expanding. Over recent years the company has always been able to generate an operating profit of between 250 and 400 million euros. One of its main contracts, to be delivered by the end of 2015, is installing Lufthansa’s premium economy class cabins and the latest generation of inflight entertainment in the carrier’s 95 long-haul planes. Protected under plastic sheeting, the seat rows are already awaiting installation. 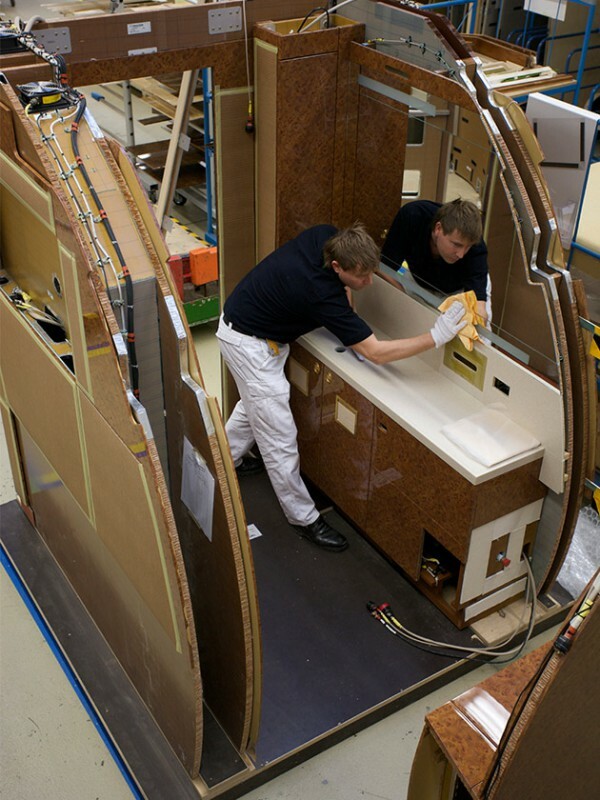 Meanwhile, the employees dismantle the old seating in the front part of the main cabin of an Airbus A380, whose 24 meter-high vertical stabilizer juts out of the hangar gates. After only four days, the plane is ready to go back into scheduled service. In another hangar, an Airbus is undergoing a “D-Check,” which is the most in-depth service stop of them all. Depending on the type of aircraft, this general overhaul is carried out every 10 years or every 25,000 operating hours. The jet is taken apart, right down to its basic structure. Even the galleys and the lavatories have to be removed, the engines are dismantled and the paint on the exterior of the fuselage is stripped off. After a minimum of four weeks of round-the-clock work in three shifts, the plane gets a fresh coat of paint and looks as good as new. 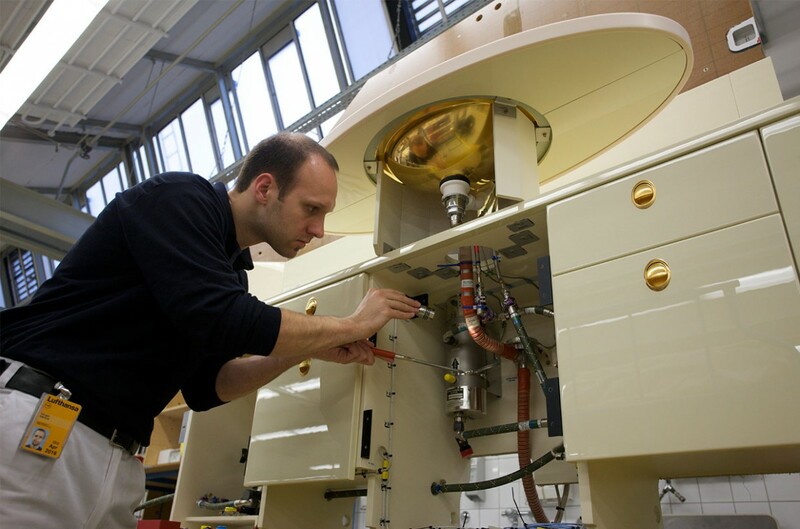 Apart from servicing and the logistics chain, which can supply more than 100,000 spare parts and has a dedicated 24-hour team, fitting out specialized planes is among the most interesting challenges for the engineers and technicians at Lufthansa Technik. For example, at the end of 2014, a Lufthansa Airbus A340-300 was converted into an evacuation aircraft for highly infectious patients, in co-operation with the Robert Koch Institute. Almost at the same time, a Boeing 747SP jointly owned by NASA and the German Aerospace Center (DLR) also left the hangar. This jet, which has been called a flying observatory, boasts a door for a telescope towards the rear of the plane, which can be opened in-flight. And in Hangar 5, the former German government plane “Konrad Adenauer” was converted into a zero-G plane for the Novespace research company. On this Airbus A310, trainee astronauts can experience zero gravity in parabolic flight. “Many researchers are waiting impatiently to conduct their experiments,” said DLR project manager Ulrike Friedrich at the handover of the aircraft in March.